> What is the difference between a Swarm and a Colony of Bees? A common question we get asked is, ’I want to buy a swarm, do you have one?’ Over time we began to realise that many new comers to beekeeping were confusing a Swarm with a Colony. So here’s a quick guide. This is a wild cluster of unknown bees that have left an established colony of bees. There will be a queen (unmated?) and around 10-30,000 bees only, no frames or honeycomb in which to breed yet. NEVER BUY A SWARM! A swarm is an unknown quantity, possibly with disease, bad tempered or just love to swarm. Ask yourself, why did these bees swarm in the first place? We find the top answer to be, the owner beekeeper left them alone because they were so bad tempered and aggressive. In time the bees built up in size and without proper management from the beekeeper (really only a keeper of bees!) the bees swarmed. A swarm is fine in the hands of a seasoned beekeepers but no fun if you are a beginner. Chances are you are just taking on someone else’s problem bees. This is an established working group of bees with a mated laying queen and worker bees on frames of drawn comb. There will be eggs, open brood and sealed brood (all stages of development in spring & summer). This is what you buy and pay for. But beware-since the recent boom in beekeeping interest loads of ‘over night bee breeders’ have emerged from nowhere. Bee breeding is a very involved scientific matter. Very few come close to being able to say they are bee breeders let alone sell bees. A-Ask many questions even if this person is the head of a beekeeping Association this does not mean they are qualified to sell bees or have applied selected breeding technics. Most beekeepers in time can fumble through making a nuc but not of a quality that you should be paying for. B-Don’t let them push you around with, ‘I have been a beekeeper for over 30 years!’ I knew of a beekeeper, head of his county beekeeping association selling bees. He asked me about queen cells on a frame he had which turned out to be drone brood, a VERY basic thing that most beekeepers know. I was shocked and worried for all those who had bought his nucs. C-Examine the nuc before you buy. Never buy bees that are posted to you. A convenient way to get your bees, only to be disappointed once you open them up. Bees that are posted never do well in transit. If you pick them up yourself, you are able to look them over, find the queen, see all the stages of development and care for them on the journey home. If it is a long distance then take a spray bottle full of fresh water and 3 tablespoons of cane sugar. You can spray the bees through the travel air mesh to keep them cool so they do not over heat. I hear far too many sad stories about bees overheating and dying when posted, as there is no one to cool them down or handle them with gentle care during transit. Remember this is going to be your hobby. If you want to enjoy your bees spend your money here, you can save money elsewhere. Do your research before you go out asking about buying bees. The better information you have on hand will arm you with the ability to make the right choice from the right person. Don’t miss our next article- Buying Beekeeping ‘SECONDS’ A nice way of saying Defective! A must read before you buy. Save money and time. Subscribe now not to miss these updates. 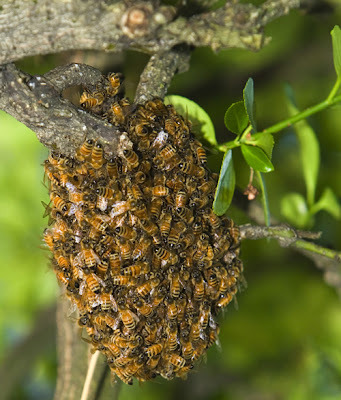 Swarms are great for new beekeepers. It is natural instinct for bees to swarm. We try our best to suppress it, but a hive that swarmed is not necessarily a bad hive. In addition, 9 times out of 10 the queen in the swarm is already mated. The only time you will find a virgin queen in a swarm typically is if it is a small afterswarm. Thanks for sharing such and useful and informative post on difference between a Swarm and a Colony of Bees. Really nice to know and make comment on it. Keep Sharing.